I have tried alot of different shoes in my playing career; Footjoy, Nike, Addidas, and a few others, but I just couldn't find one that was comfortable. Until now! The Bite Deuce is a VERY comfortable shoe and the ventilation is perfect for hot weather climates. The only disadvantage is that your feet can get wet (through the mesh) and they are not condusive to cold weather. 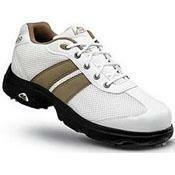 Overall a great lightweight comfortable golf shoe.